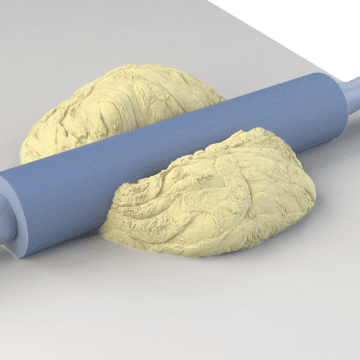 An essential tool for bakers, rolling pins are used to flatten pizza dough, pastry, and pie crusts to a smooth sheet with consistent thickness. These pins have a barrel and two handles and are made of either wood or aluminum. Wood rolling pins are heavier than aluminum pins, making them well suited for rolling out thicker dough. Aluminum rolling pins have a smooth surface that helps prevent sticking and ergonomic handles for a more comfortable grip. For best results, choose a rolling pin size that is larger than the expected size of the rolled-out dough.